A wardrobe is indispensable in the bedroom and completes your room. In this extensive collection you'll find the appropriate wardrobe fitting each bed. There is a choice of hinged door and sliding door wardrobes, with drawers and mirror. Usually with a short delivery time. 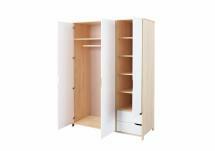 You can choose of a large variety of wardrobes with sliding doors. There are also sliding door cabinets with mirror. This type of cabinet occupies the least space in the bedroom and still offers plenty of storage space. The wardrobes, made of solid wood, are distinguished by their solid manufacture and modern design. The solid wood gives these cabinets a high stability and guarantees durability. If you have any questions, simply use the information button near the cabinet of your choice.